Why day 298 of the earth’s cycle ? Why not 297 ? Before I present the science, I’ll have to provide the natural history behind the phenomena, which is intimately tied to my personal history. 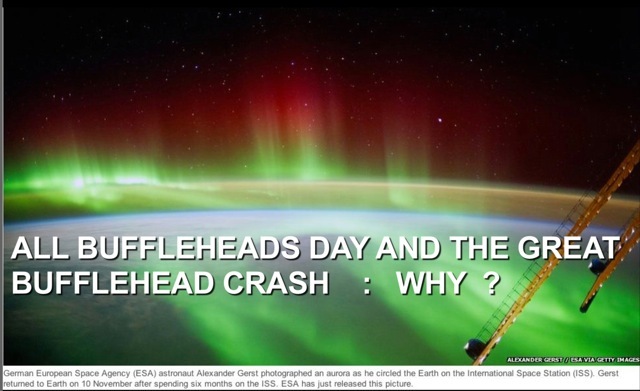 First the facts : All Buffleheads Day (ABD) is an international standard, the 298th day of the earth’s revolution, measured at latitude 48 39 and 123 23 810 degrees west of the Prime Meridian. This is roughly eight hours behind Greenwich Mean Time (GMT), now Coordinated Universal Time (UTC), and like it, measured at the oceanic interface, facing into the weather and the future. Unlike GMT, ABD is not arbitrary. It is biologically based. In most years it will occur on October 15th, the day the first Bufflehead returns to its winter habitat in Shoal Harbour Migratory Bird Sanctuary, Vancouver Island. In Leap Years it will occur on the 14th of October. This was the case in 1940, when it preceded the Great Bufflehead Crash by twenty days. The Great Bufflehead Crash (GBC) happened on Monday night, November 4th, 1940. It occurred in eastern Saskatchewan, along a forty kilometer stretch of the Yellowhead corridor when migrating Buffleheads crash landed under mysterious circumstances. Casualties were in the thousands.